One of the biggest killers to performance and your attempt to make significant strength gains is a lack of mobility in your major joints. The most common joints where problems originate tend to be either at the hips or shoulders. Of course this isn’t the case all of the time, but these particular ball and socket joints are the main attachments to our center mass, or trunk, which is where most of the problems tend to occur. 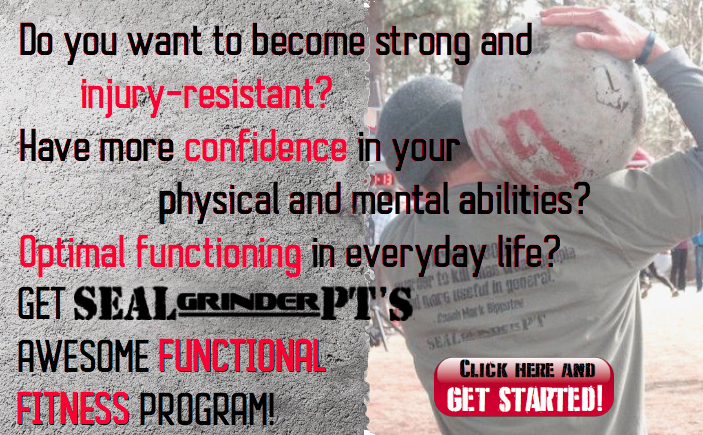 I’m going to address how you can work on fixing that problem at least concerning your hips for today. To help you to do this I’ve come up with what I call the 4 point hip stretch approach. I call it the 4 point approach because I’ll be showing you how to stretch all 4 areas of your hip from the front (hip flexor), outside of your hips (abductors), inside of your hips (adductors), and the back side of your hips (glute/hamstrings). This stretch involves a bit of a dynamic and static approach to stretch out your groin muscles. The groin area is one of the toughest and most stubborn areas of the human body to stretch for a lot of people. 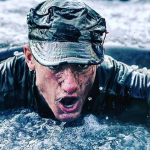 With this stretch you want to make sure you get yourself into a crawl like position on your knees with your knees spread out as far as you’re able to stand it. Place your forearms on the ground and hold this position to settle your body into the stretch for a bit. As you feel your groin and inner thighs start to respond, simply start sitting back moving your rear closer towards your ankles. Settle at that ROM for a moment and then rock your hips forward bringing your hips towards your elbows. A few things to note: The tighter you are the longer it may make take for your muscles to respond. Start slowly and gradually pick up the pace of the rocking back and forth. Make sure it’s a slow steady movement. Perform this stretch for at least 2 minutes, or longer if needed prior to your more aggressive lower body training. One very common area of the hip that tends be forgotten by many is the hip flexor and front of the thigh. I’ve found this part of the hip tends to be forgotten as most everyone will place emphasis on just the posterior muscles (glutes and hamstrings) when addressing a great deal of stretching movement. There is a lot more going on here with this stretch than meets the eye. First, let’s assume you’re stretching your right leg for the purpose of explanation. Start by placing your right knee on a mat for padding as you kneel with your front left leg stabilizing you at a 90 degree angle. Next, grab your right foot and pull your right heel towards your rear and sit upright with good posture. Now this next part is really crucial. Once you get your heel pulled towards your right glute contract that right glute muscle and you’ll feel a tremendous stretch in your right thigh and hip flexor. Contracting that right glute muscle as you pull your heel into position flexing your right knee will create a more passive stretch as your contracting muscle will stretch the antagonist muscle (your thigh) creating a much more aggressive stretch for you. A few things to note: Make sure you gauge your ROM carefully if you’re really tight and have issues with getting into full knee flexion. If you do have an issue with grabbing your ankle you can modify this stretch by either setting up some steps to place your foot on for the stretch for a slightly less ROM until you can improve your ROM. Perform this stretch holding for at least a minute on each leg. For this stretch, you definitely should get some quality relief for your low back and hips if you are experiencing some serious tightness. For the sake of explanation, let’s assume you’re stretching your right hamstring and glute for the split stretch. Once again you’ll be kneeling, but this time your left knee will be on the ground with your right leg extended out in front of you. When you extend your right leg work to straighten and lock out your right knee completely while flexing your right ankle pointing your toes towards the sky. Next, you want to make sure that you keep your hips square and pry into the stretch to really elongate that right hamstring muscle. Of course, you can gauge your ROM to scale the intensity of the stretch to suit your individual needs. A few things to note: For a more intense stretch simply slide the left knee back bringing your body into a more full split. Do the opposite for a less intense stretch. Also make sure to hold this stretch for at least for one minute. Of course you can go longer if needed. Another key component on the hip that can be neglected at times is the outside of the hip, or abductors. Tightness here can also be a contributor to your low back pain and soreness if you tend to experience some of that. Once again, let’s assume you’re stretching your right abductor for the sake of explanation. Get into an upright push-up position with your hands shoulder width apart in length. From here, bring your right knee up, bend it, and place it on the ground between your hands. Once into position allow your right hip to settle straight down into the ground stretching the outside of your right hip. Try to not rock over to your right side (unless you’re trying to lessen the intensity of the stretch), but rather allow your hips to lower directly down into the mat. As you do this sit upright with good posture. A few things to note: To lessen the intensity of this stretch rock over to your side. You can also modify this by getting your stretching leg into the same position on an elevated surface such as a plyometric box. Hold this stretch for at least one minute to alleviate stiffness prior to more intense lower body training. Just remember that if you’re looking to optimize your strength and performance you’ve got to get rid of joint tightness and inhibition first. When it comes to making some of the biggest strength gains and being able to perform at your peak in either fighting, or for any other sport you’ve got to unlock your hips in order to function. Are you currently including any hip stretches for your training? What stretches and mobility work do you currently do in order to prepare your body for training? 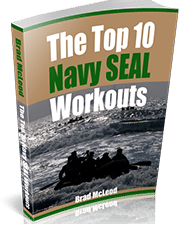 Also if you’re really looking to learn more about this and to supercharge your training in other ways make sure to visit my website, Brandon Richey Fitness. 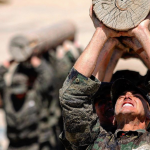 Written by Brandon Richey, SGPT coach Brandon Richey , the 120-Day Training Plan to Build Powerful Functional Fitness is designed to transform your body and mind. 63 demonstration videos • Training articles • In-depth information on functional fitness and how it’s vital to living a full life • …And much more! QUESTION: Coach, what do you recommend for more mobility? I’m not real flexible and it’s making it hard to get the gains I want. 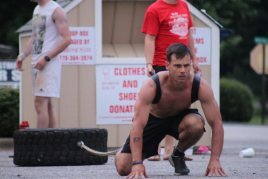 ANSWER: Check out this article—SEALgrinderPT Mobility Workouts. QUESTION: I need a new backpack. Do you have any you like and recommend? ANSWER: Yes, check out this article: Top 10 Special Forces Backpacks.